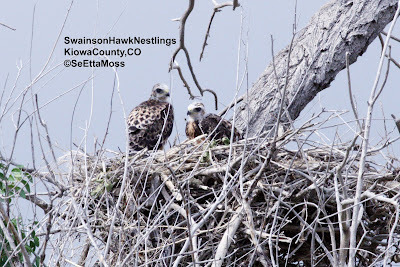 I drove down to Adobe Creek Res (aka Lue Lake) just north of Las Animas, CO two days ago to take advantage of the astoundingly mild temps to do some birding. Usually the temps on the Eastern Colo plains are around 100 degrees in late July, but they only rose to around 80 degrees in early afternoon then dropped to the low 70's as a series of thunderstorms moved through the area. 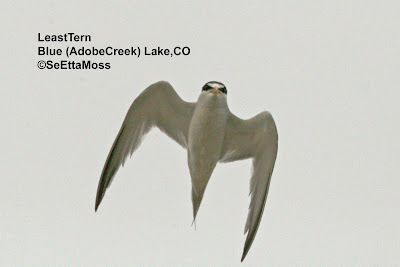 Adobe Creek is one of currently only 2 locations in Colo where Least Terns as well as Piping Plovers nest. 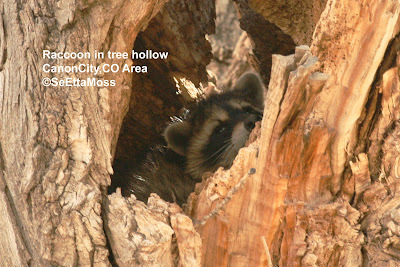 Federally listed as Endangered, the area around the locations where they choose to nest are cordoned off to make a nesting exclosure to protect them. 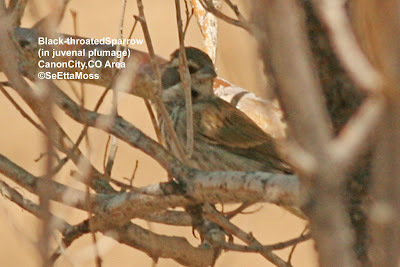 This morning I looked and listened at the location I have seen the Black-throated Sparrows for an hour to no avail. 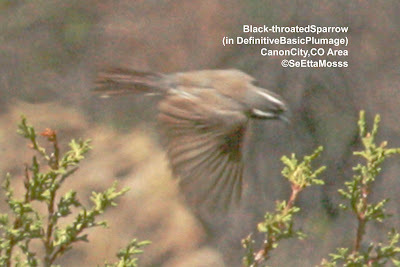 As I started to leave, I spotted two sparrows several hundred yards further east and they were Black-throated Sparrows. 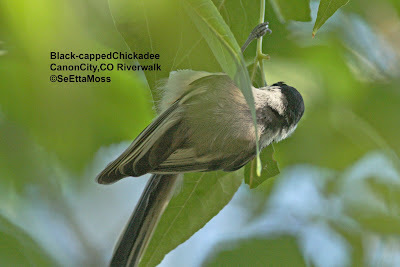 I subsequently saw at least 5, of which two were adults and at least 2 were in juvenal plumage, and possibly 6 Black-throated Sparrows at this new location. I have updated the google map to show the new location (link in post below). The top pic is of an adult bird in flight showing it's brownish back and wings nicely. I couldn't help but to put up a few more pics I got today of the Black-throated Sparrows since they came out pretty darn good, especially as they are all hand-help pics with the birds more than 50 feet away (and sparrows are small objects at that distance). The top pic is an adult bird and this pic shows nicely the brownish back feathers over the grayish crown, ear coverts, sides and flanks. I'm not sure if this is the same adult as in the pic in the post below, or possibly the female. This bird was in a snag that the young bird in juvenal plumage in the bottom two pics flew into. 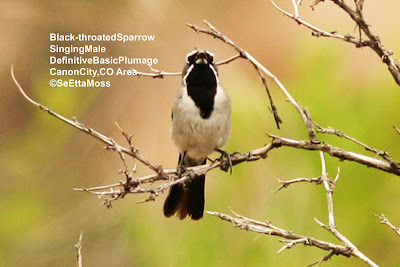 As I drove down a gravel road a few miles south of Canon City this morning, I heard some chirping coming from a dry gulch near the road. 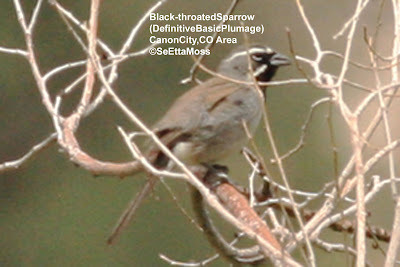 I stopped and was delighted to see 4-5 Black-throated Sparrows in a small deciduous tree. 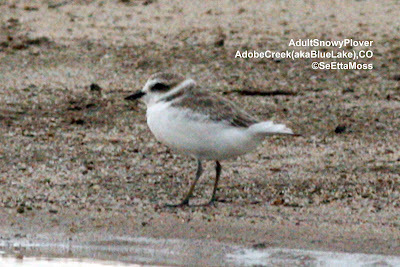 At least one was an adult and several were in juvenal plumage with a streaky breast but with a bold white supercilium as shown by the two different birds in these pics (while pics not the best, they will enlarge to show very close-up views--just double-click on each pic).